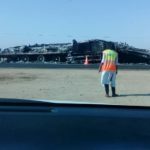 Pictured: Burning truck trailer on the B2 Highway near Swakopmund. 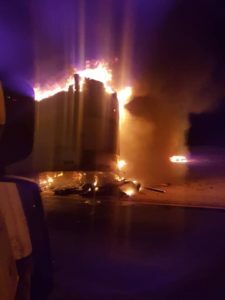 FLAMES destroyed a heavy truck transporting a consignment of frozen pig and sheep carcasses from Mariental to Walvis Bay in the early hours of Wednesday morning. 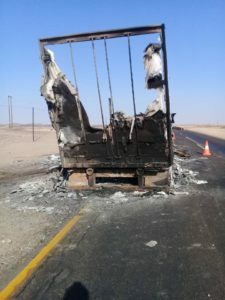 According to the official report provided by the Erongo Regional Crime Investigations Coordinator, Deputy Commissioner Erastus Iikuyu, the incident occurred about 30 kilometres from Swakopmund while the driver was on his way from Arandis. It is alleged that a tyre on the right side of refrigerated trailer burst which caused the driver to almost lose control over the vehicle. 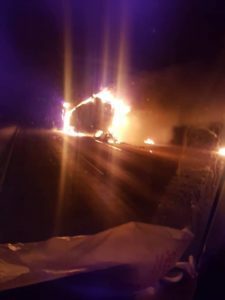 He managed to bring the truck to a controlled stop and when he got out to investigate and he found that the tyre and part of the trailer was already burning. The report states that the driver then unhooked the trailer from the Scania truck that belongs to Dikwels Transport Company. He drove the truck to a safe distance from the burning trailer and contacted the emergency services for assistance. The consignment consisted of 95 halved pork carcasses, 135 full Sheep carcasses and 105 boxes of tripe (afval). The refrigerated trailer and its content, estimated to be worth about N$500 000, was burned to ashes.